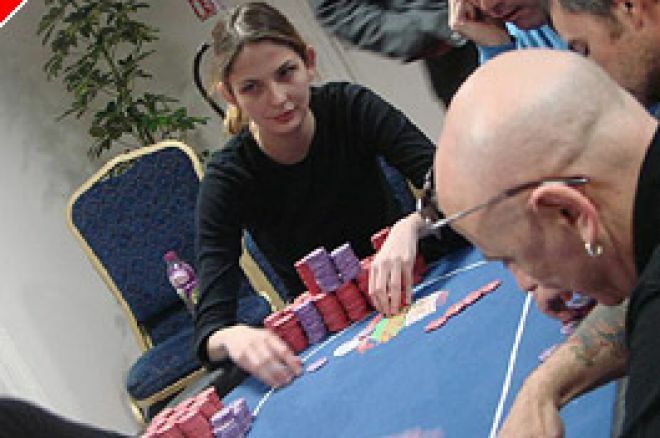 We've caught up with one of the rising stars of the UK poker scene, Blondepokers very own Jen Mason, to talk about winning the Green Joker Poker festival, being a poker blogger and being a poker blagger. Pokernews: Jen, congratulations on winning the Green Joker festival back in May, it's marked a bit of a change in direction for you hasn't it? Jen Mason: I am well known for updating but I'm also well known for always being skint. Updating isn't very well paid and it also takes up all your time ever, so winning the Green Joker festival was a catalyst for change. I saved up for months for that tournament too which is embarrassing. JM: It was nice to have so many chips, that was a pretty awesome feeling on its own. I rank it right up there with that feeling, when you wake up and realise you don't have to get up, so you can go back to sleep again, that's my all time favourite feeling. PN: You were one of the first people blogging in Europe, now everybody is doing it, how has it changed over the last couple of years? JM: It was bigger in America at the time, nothing like it is now. Some of the tournaments would just have us and Rolf Slotbloom from Cardplayer, who was always really into it for some reason. Back at the 2005 WSOP I used to have to do updates in the hallways because I didn't have a press pass. I was having to adopt a gorilla style of live update where I would sneak into the card room and get thrown out every half hour. It was freezing too, that was my introduction to blogging. PN: You are also quite the poker blagger too, we hear Roland De Wolfe offered to pay you into the WSOP main event if you stopped smoking? JM: Yes he did, he's a true gent and I haven't smoked a cigarette since even though I could now if I wanted to. If I'd managed to give him a decent return on his money, instead of busting on day 1, I would have now smoked like a chimney. But seeing as I didn't cash I think it's only sportsmanlike to give up as he genuinely wants me to stop. PN: You did do slightly better a week earlier though, when Mickey Wernick bought you into the Bellagio Cup? JM: Can you believe that? I had like 3 days off before the main event and Mickey Wernick just gave me $500 and I said ok. I came 5th in that event I gave him half of what I won, so yay thank you Mickey. PN: Is anybody else throwing money at you? JM: Poker.co.uk have bought me into the Party Poker World Women's Open, which was very hard to turn down, hopefully I can get some good airtime for them wearing their T-shirt. PN: So what s next for you? Back to updating or more playing? Not much work if I can avoid it. I'm going to try to maintain a better balance between work, playing poker and having a social life. It was all going a bit one sided but has regained a little equilibrium. Occasional updating and occasional festivals, it's so easy to wang a medium bankroll and getting overexcited and playing every festival there is. I've seen so many people do it. PN: Any particular festivals you'll be wanging your bankroll on? Ive already booked my ticket to Aruba. I would be very happy to get cryogenically frozen and pulled out for the beginning of Aruba. JM: No no, thank you.